This week we interview Joshua Collins who is running for Congress in Washington's 10th Congressional District. We talk about his district, his platform, and the steps he needs to take to to become a Congressman! Check out Joshua on Twitter at https://twitter.com/Joshua4Congress If you want to donate to Joshua you can do so by visiting https://www.crowdpac.com/campaigns/388448/joshua-collins Check us out on iTunes at https://itunes.apple.com/us/podcast/dumb-all-over/id1200040157?mt=2 and Spreaker at https://www.spreaker.com/show/dumb-all-over Check out our website at www.dumballoverpod.com To follow our everyday shenanigans follow us on the social medias. Twitter - https://twitter.com/DumbAllOverPod Facebook - https://www.facebook.com/DumbAllOverPod Instagram - https://www.instagram.com/dumballoverpod/ And to help support the show please visit our Patreon page at https://www.patreon.com/dumballoverpod As always please feel free to leave a comment or follow us wherever you can! Your support means everything to us! World, UK, and Not America Correspondent Steven joins us to update us on news from around the world! This week is Brexit heavy as Brexit continues to flop on a global stage. Be sure to follow Steven on Twitter https://twitter.com/Properganda4 and check out his podcast on Twitter at https://twitter.com/rbritanniapod Check us out on iTunes at https://itunes.apple.com/us/podcast/dumb-all-over/id1200040157?mt=2 and Spreaker at https://www.spreaker.com/show/dumb-all-over Check out our website at www.dumballoverpod.com To follow our everyday shenanigans follow us on the social medias. Twitter - https://twitter.com/DumbAllOverPod Facebook - https://www.facebook.com/DumbAllOverPod Instagram - https://www.instagram.com/dumballoverpod/ And to help support the show please visit our Patreon page at https://www.patreon.com/dumballoverpod As always please feel free to leave a comment or follow us wherever you can! Your support means everything to us! We may be a month late with this episode but here it is anyway! All the news from the world... from last month... brought to you by our friend and colleague as well as our World, UK, and Not America Correspondent Steven! Enjoy! Check us out on iTunes at https://itunes.apple.com/us/podcast/dumb-all-over/id1200040157?mt=2 and Spreaker at https://www.spreaker.com/show/dumb-all-over Check out our website at www.dumballoverpod.com To follow our everyday shenanigans follow us on the social medias. Twitter - https://twitter.com/DumbAllOverPod Facebook - https://www.facebook.com/DumbAllOverPod Instagram - https://www.instagram.com/dumballoverpod/ And to help support the show please visit our Patreon page at https://www.patreon.com/dumballoverpod If you are a podcast and you are interested in becoming a member of a podcast network for FREE, be sure to check out our new network. The Famous Original Podcast Network at www.fopnet.biz As always please feel free to leave a comment or follow us wherever you can! Your support means everything to us! New Week, more stories, more nonsense. Bernie’s campaign unionizes, Rush Limbaugh says stupid stuff, and other fun stories. Check us out on iTunes at https://itunes.apple.com/us/podcast/dumb-all-over/id1200040157?mt=2 and Spreaker at https://www.spreaker.com/show/dumb-all-over Check out our website at www.dumballoverpod.com To follow our everyday shenanigans follow us on the social medias. 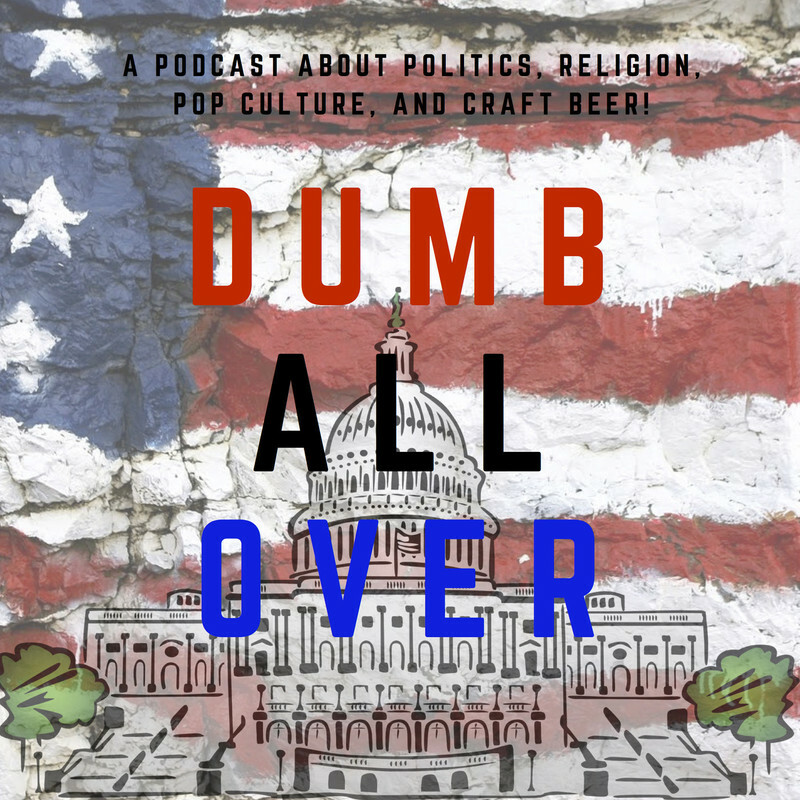 Twitter - https://twitter.com/DumbAllOverPod Facebook - https://www.facebook.com/DumbAllOverPod Instagram - https://www.instagram.com/dumballoverpod/ And to help support the show please visit our Patreon page at https://www.patreon.com/dumballoverpod If you are a podcast and you are interested in becoming a member of a podcast network for FREE, be sure to check out our new network. The Famous Original Podcast Network at www.fopnet.biz As always please feel free to leave a comment or follow us wherever you can! Your support means everything to us! Somehow we have made it through the unexpected break since the last episode and we are back! Due to the fact that we missed the last month of news we do a recap of whatever we could. We talk about Bernie Sanders and his 2020 Presidential campaign announcement. We talk about the Michael Cohen hearing that provided us with hours of entertainment. We also talk about how Tucker Carlson’s past is exactly as we thought it would be, and what his future holds for him. We also cover some other stuff and then some AOC news! Check us out on iTunes at https://itunes.apple.com/us/podcast/dumb-all-over/id1200040157?mt=2 and Spreaker at https://www.spreaker.com/show/dumb-all-over Check out our website at www.dumballoverpod.com To follow our everyday shenanigans follow us on the social medias. Twitter - https://twitter.com/DumbAllOverPod Facebook - https://www.facebook.com/DumbAllOverPod Instagram - https://www.instagram.com/dumballoverpod/ And to help support the show please visit our Patreon page at https://www.patreon.com/dumballoverpod If you are a podcast and you are interested in becoming a member of a podcast network for FREE, be sure to check out our new network. The Famous Original Podcast Network at www.fopnet.biz As always please feel free to leave a comment or follow us wherever you can! Your support means everything to us! Sorry for the delay in posting an episode, we've had some things going on in our lives that we've had to deal with. But we did a recoding from a couple weeks ago and we're releasing it now! Thanks everyone for your patience! This week we discuss round two of the Virginia blackface situation as well as some new problems coming from the states leadership. We rant and rave around why this is even a thing in 2019. We then move on to talk about the State of the Union and the aftermath of it. We also cover some new AOC news which includes her Green New Deal. We then find out if you watched the Super Bowl and then we answer your questions from Twitter. Check out Austin’s twitch channel at: https://www.twitch.tv/amplifireaustin Check us out on iTunes at https://itunes.apple.com/us/podcast/dumb-all-over/id1200040157?mt=2 and Spreaker at https://www.spreaker.com/show/dumb-all-over Check out our website at www.dumballoverpod.com To follow our everyday shenanigans follow us on the social medias. Twitter - https://twitter.com/DumbAllOverPod Facebook - https://www.facebook.com/DumbAllOverPod Instagram - https://www.instagram.com/dumballoverpod/ And to help support the show please visit our Patreon page at https://www.patreon.com/dumballoverpod If you are a podcast and you are interested in becoming a member of a podcast network for FREE, be sure to check out our new network. The Famous Original Podcast Network at www.fopnet.biz As always please feel free to leave a comment or follow us wherever you can! Your support means everything to us! This week we discuss the latest involving the disgusting photo in Virginia Governor Ralph Northam yearbook as well as his response. We talk about Bernie Sanders new bill which would change estate tax in this country. We also listen to Mayor De Blasio of NYC as he talks about Progressive ideology on Real Time. Finally we talk about Alexandria Ocasio-Cortez! We then answer your amazing questions on this week’s Twitter Time! Check out Austin’s twitch channel at: https://www.twitch.tv/amplifireaustin Check us out on iTunes at https://itunes.apple.com/us/podcast/dumb-all-over/id1200040157?mt=2 and Spreaker at https://www.spreaker.com/show/dumb-all-over Check out our website at www.dumballoverpod.com To follow our everyday shenanigans follow us on the social medias. Twitter - https://twitter.com/DumbAllOverPod Facebook - https://www.facebook.com/DumbAllOverPod Instagram - https://www.instagram.com/dumballoverpod/ And to help support the show please visit our Patreon page at https://www.patreon.com/dumballoverpod If you are a podcast and you are interested in becoming a member of a podcast network for FREE, be sure to check out our new network. The Famous Original Podcast Network at www.fopnet.biz As always please feel free to leave a comment or follow us wherever you can! Your support means everything to us! This week we talk about the end (for now) of the Government shutdown, Declared Presidential candidates, yet another shooting, and some updates on Roger Stone and how arrested he is... Check out Tom’s twitch channel at: https://www.twitch.tv/death0ntw0legs Check out Austin’s twitch channel at: https://www.twitch.tv/amplifireaustin Check us out on iTunes at https://itunes.apple.com/us/podcast/dumb-all-over/id1200040157?mt=2 and Spreaker at https://www.spreaker.com/show/dumb-all-over Check out our website at www.dumballoverpod.com To follow our everyday shenanigans follow us on the social medias. Twitter - https://twitter.com/DumbAllOverPod Facebook - https://www.facebook.com/DumbAllOverPod Instagram - https://www.instagram.com/dumballoverpod/ And to help support the show please visit our Patreon page at https://www.patreon.com/dumballoverpod If you are a podcast and you are interested in becoming a member of a podcast network for FREE, be sure to check out our new network. The Famous Original Podcast Network at www.fopnet.biz As always please feel free to leave a comment or follow us wherever you can! Your support means everything to us!